In discussing the United States’ long-term budget outlook ('The reality of America’s fiscal future', October 22), Martin Wolf notes that, according to the CBO, “a rise in federal revenue to 22 percent of GDP may be needed.” He describes this target as “surely achievable”. A glance over the historical data suggests otherwise. 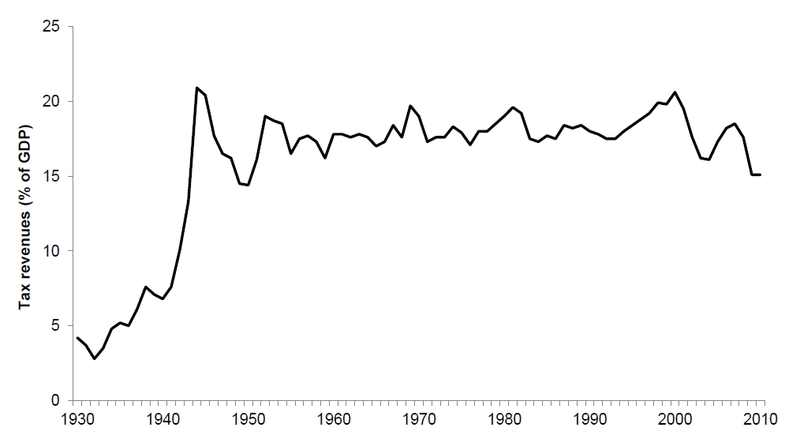 The accompanying chart plots federal tax receipts as a percentage of GDP between 1930 and 2010. (Data are from the White House Office of Budget and Management, Historical Tables, Table 1.2.) Since the Second World War, revenues have remained relatively stable at around 18% of GDP. They have never amounted to more than 20.9% of GDP. This stability is all the more remarkable given substantial variation in tax rates over the 20th century. During the 1950s, for example, the top marginal tax rate on income was over 90%. In 2012, tax revenues amounted to only 15.8% of GDP, which suggests that, as the recovery continues, there is some scope for reducing the deficit through increases in revenue. However, a jump to 22% of GDP would be without historical precedent. I am aware of this fact. But the simple truth is that this stability is not compatible with the survival of the programmes the US has legislated, in an ageing society. So Americans have to choose. Raising the revenue ratio to 22 per cent or so seems to be the most effective way to meet its commitments. The alternative is to push granny under a bus. That is not going to happen. Letting the rest of government disappear is fairly crazy. So one is left with higher taxation. Are Americans happy with how their tax money is being spent? 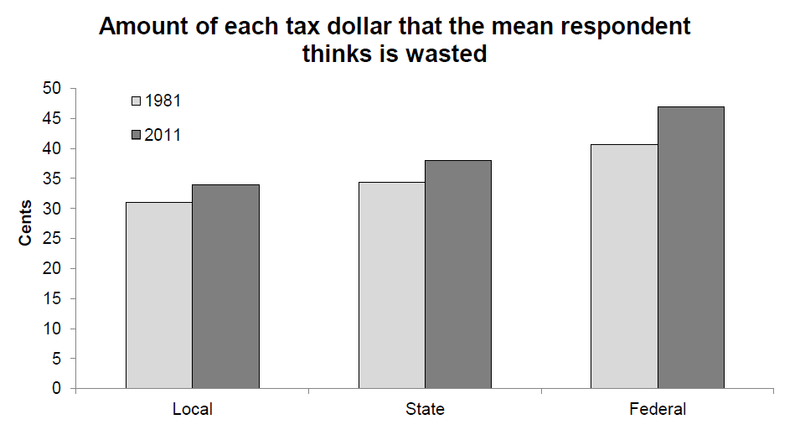 Continuing with my recent theme of satisfaction with government in the United States, here I look at Americans' about beliefs about how effectively their tax money is being spent, using figures from Gallup. 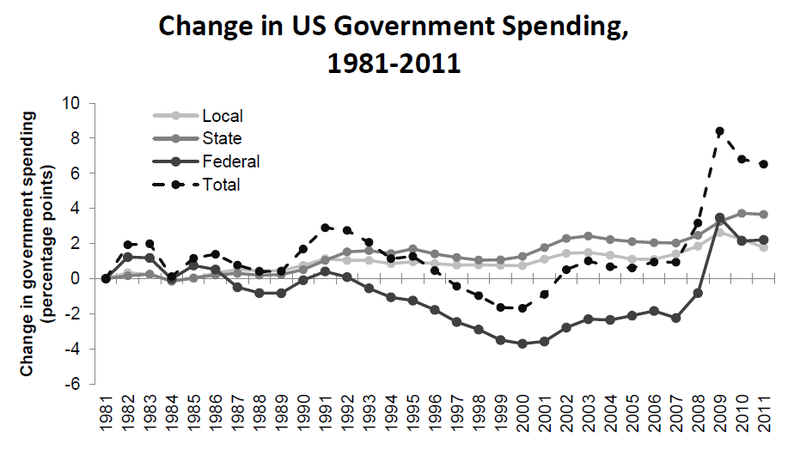 The first chart shows the change in local, state, federal and total government spending (as a percentage of GDP) in the US, between 1981 and 2011. Both local and state spending rose slowly but steadily throughout the period, increasing overall by about 2 and 3 percentage-points (of GDP), respectively. In contrast, federal government spending fell during the late 1980s and 1990s, and then rose again during the 2000s. It then increased rapidly at the onset of the financial crisis (due to a combination of lower GDP, the bank- and auto-bailouts, and the stimulus bill), so that--by 2011--it was about 2 percentage-points (of GDP) higher than it had been in 1981. 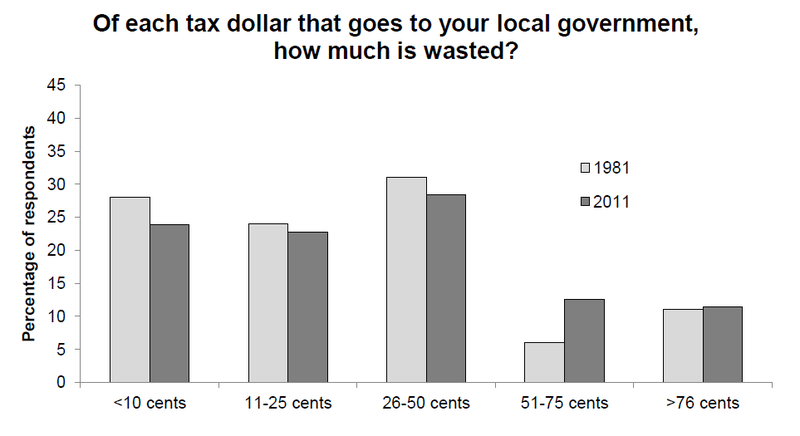 Total government spending fluctuated up and down during the 1980s and early 1990s, declined during the late 1990s, and then rose during the 2000s. It was just under 8 percentage-points (of GDP) higher in 2011 than it had been in 1981. 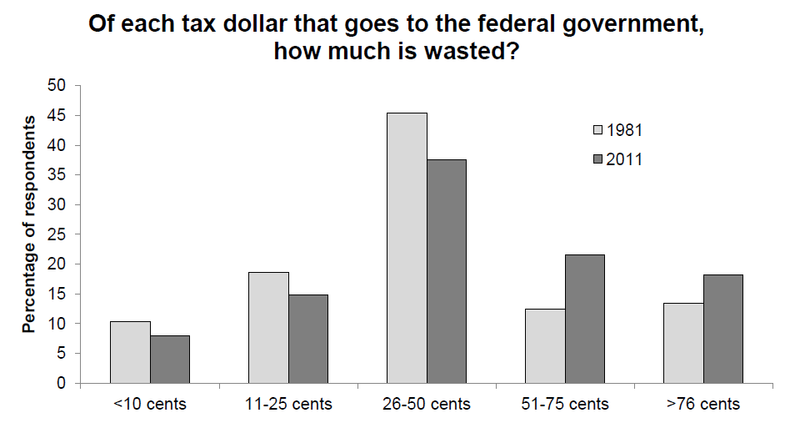 In all three cases, the distribution of answers is shifted to the right for 2011, indicating that Americans believed that the government was wasting fewer cents out of each dollar in 1981. The descrepancy is largest with respect to federal taxes, and is smallest with respect to local taxes--a result that is shown more clearly in the final graph (below). These figures show that, with higher government spending, Americans believe the average tax dollar is spent less efficiently. There are a number of possible interpretations of this result. First, if Americans' beliefs are unbiased on average, then as government spending increases, each tax dollar really is spent less efficiently. 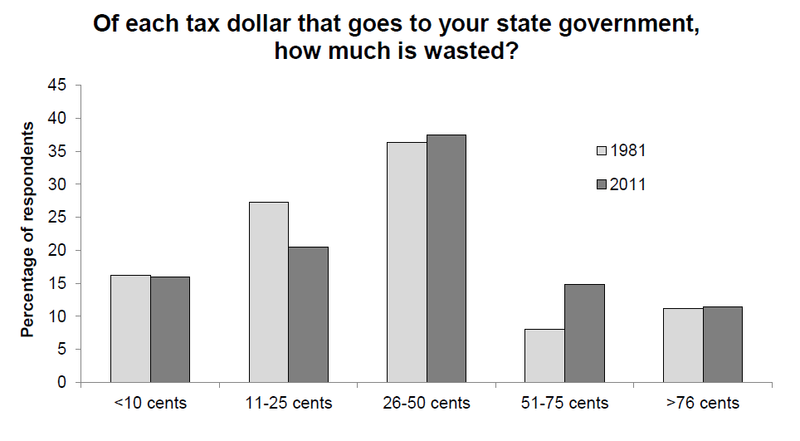 Second, as government spending increases, media efforts by those opposed to higher government spending (e.g., The Tea Party) systemtatically distort Americans' beliefs about government spending, even though spending does not actually become any less efficient. Third, the apparent trend may simply be an effect of the bailouts and stimulus bill. In particular, while an increase in government spending on, say, education or roads does not make spending any less efficient, the bailouts and stimulus bill were highly inefficient--or at least, were perceived to have been so by many Americans. Only 26% of Americans believe that "the Republican and Democratic parties do an adequate job of representing the American people". 60% now believe that "they do such a poor job that a third major party is needed." 71% of Independents, 52% of Republicans and 49% of Democrats believe that a third party is needed. Read the article at Gallup. As this article at Open Europe reports, the EU budget-deal will cut funding for the Common Agricultural Policy (CAP) considerably. Between 2007 and 2013, the EU spent 56 billion euros per year on the subsidy component of the CAP, whereas between 2014 and 2020, it will spend 46 billion euros per year on it. (56 billion euros is approximately equal to the GDP of Luxembourg.) Not only will the absolute amount funding for the CAP go down, but so too will the share of the total budget allocated to the CAP. Between 2007 and 2013, the subsidy component of the CAP comprised about 32% of the EU budget, whereas between 2014 and 2020, it will comprise 28% of the budget. At the present rate of change, it will only take about 120 years to get the subsidy component of the CAP below 1 billion euros per year. Have Americans become more classically liberal since the early 2000s? To quote wikipedia, classical liberalism "advocates civil liberties, with a limited government under the rule of law, private property, and a belief in laissez-faire economic policy." Earlier this year, The Economist ran an article pointing to evidence that young people in Britain have become more classically liberal over the last few decades. In this post, I gauge the extent to which Americans' political beliefs have shifted in the direction of classical liberalism since the early 2000s. All data are from Gallup. 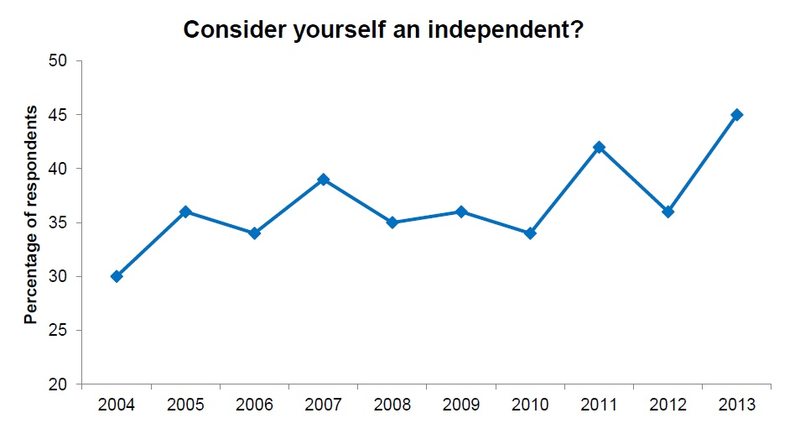 The first chart indicates that the proportion of Americans who consider themselves independents has increased by 5-10 percentage-points since 2001. Charts two and three relate to the overall scope of government. 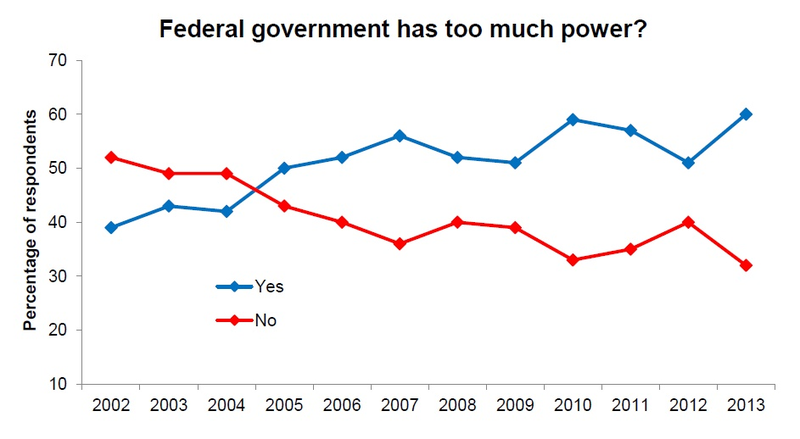 The second chart indicates that the proportion who think the federal government has too much power has increased by 5-10 percentage-points, while the proportion who think it does not has decreased by 5-10 percentage-points. 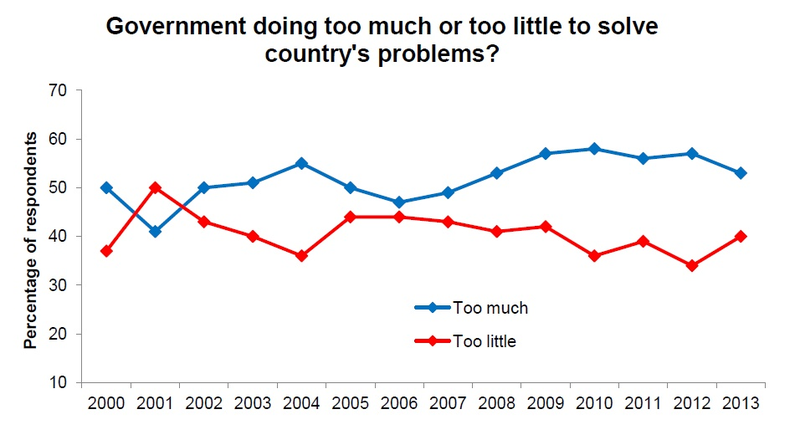 The third chart indicates that the proportion who think the government is doing too much has increased by 1-5 percentage-points, while the proportion who think it is doing too little has decreased by 1-5 percentage-points. Charts four, five, six and seven relate to economic and fiscal issues. 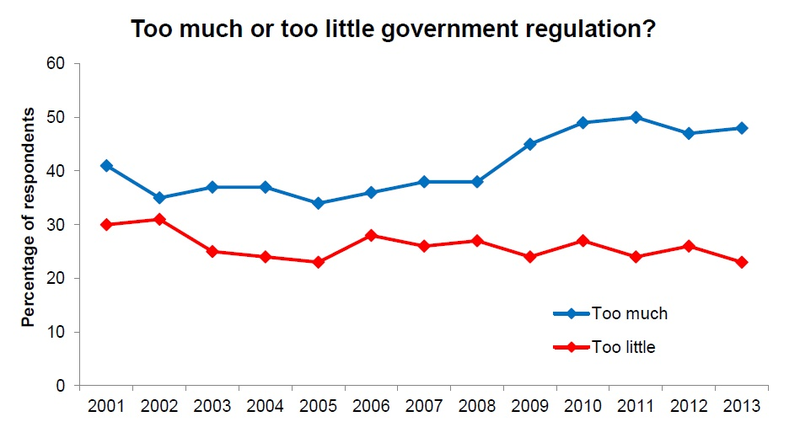 The fourth chart indicates that the proportion who think there is too much government regulation has increased by about 5 percentage-points, while the proportion who think there is too little government regulation has decreased by 1-5 percentage-points. The fifth chart indicates that the proportion who disapprove of labour unions has increased by about 5 percentage-points, while the proportion who approve of them has decreased by about 5 percentage-points; both of these changes happened quite abruptly in 2008 when Obama took office. 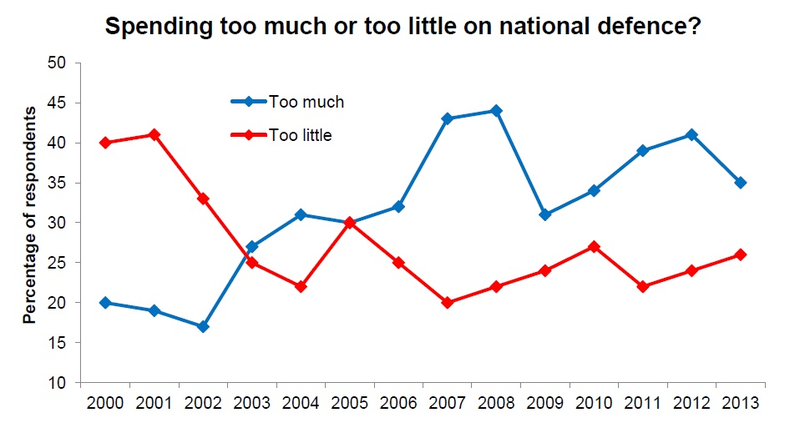 The sixth chart indicates that the proportion who think the government is spending too much on national defence has increased by about 15 percentage-points, while the proportion who think it is spending too little on national defence has decreased by about 15 percentage-points. 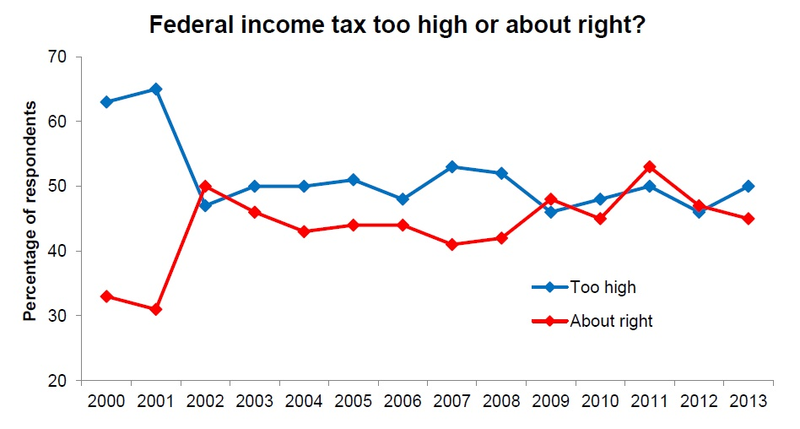 The seventh chart indicates that the proportion who think the federal income tax is too high has not changed since 2002 when the Bush tax cuts came in; the proportion who think it is about right has not changed either. Finally, charts eight, nine and ten relate to social issues. The Eighth chart indicates that the proportion who think immigration should be increased has risen by about 5 percentage-points, while the proportion who say it should be decreased has declined by 5-10 percentage-points. The ninth chart indicates that the proportion who think the government should promote traditional values has decreased by 5-10 percentage-points, while the proportion who think it should not promote them has increased by about 5 percentage-points. The tenth chart indicates that the proportion who think homosexual relations should be legal has increased by 10-15 percentage-points, while the proportion who think they should be illegal has decreased by10-15 percentage-points. Overall, these charts provide strong evidence that Americans have become more classically liberal since the early 2000s. Americans are now more likely to: consider themselves independents, think the government has too much power, think the government is doing too much, think there is too much regulation, disapprove of labour unions, think the government is spending too much on defence, favour increased immigration, and think homosexual relations should be legal. 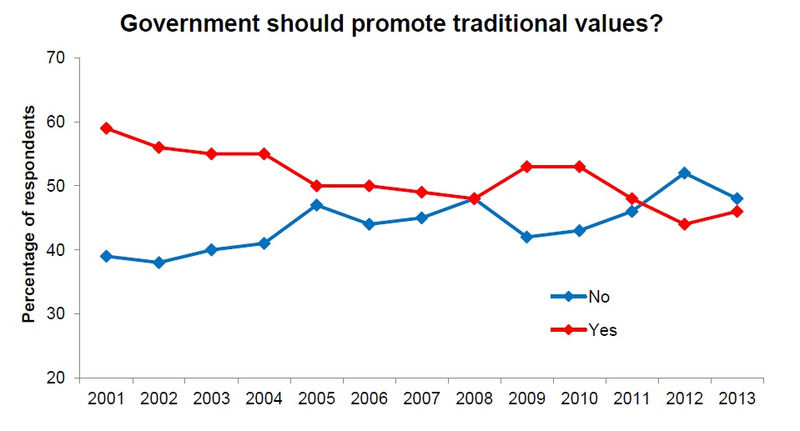 And they are less likely to think the government should promote traditional values. However, they are no more likely to think the federal income tax is too high. "There are two worldviews competing. One worldview is that the richest people deserve more status. And the other wordview is that the academically smartest people deserve more status. And there's a clash there." Does posting caloric information change consumers' caloric consumption? I just came across a study entitled Menu Labelling and Calories Purchased at Chain Restaurants by Krieger et al. The authors investigated whether displaying caloric information on menus altered customers' food and beverage choices. They took advantage of a new regulation that requires certain food outlers to display caloric information on their menus. In particular, they interviewed a large number of customers before the regulation was implemented, and a large number afterward, and then looked to see whether there was a change in the mean number of calories purchased per customer. They found that, after 18 months, mean calories purchased per customer had decreased by about 4% in chain restaurants and about 14% in coffee shops. From the perspective of getting customers to buy less calorically dense foods, these results are quite encouraging. However, there is one obvious limitation to the study. The authors had absolutely no way of knowing (as they acknowledge at the end of the paper) whether customers compensated for their choices by eating more at other meals. For example, the typical customer might have looked at the menu in the coffee shop and chosen the lower calorie option, only to then eat an extra portion of food at dinner. For this reason, I find these kind of studies largely uninformative for evaluating whether such interventions can alter consumers' caloric consumption.